The SnuzPod 3 in 1 Bedside Crib is the next generation of the award-winning, innovative SnuzPod2 Bedside Crib. It is perfectly suited to your baby from birth up to 6 months. SnuzPod3 can transform into three different modes. All of which make managing those first few months with a newborn a little bit easier for everyone. Whether you need a bedside crib, a standalone crib or even a bassinet, the SnuzPod3 can be all of these in one. 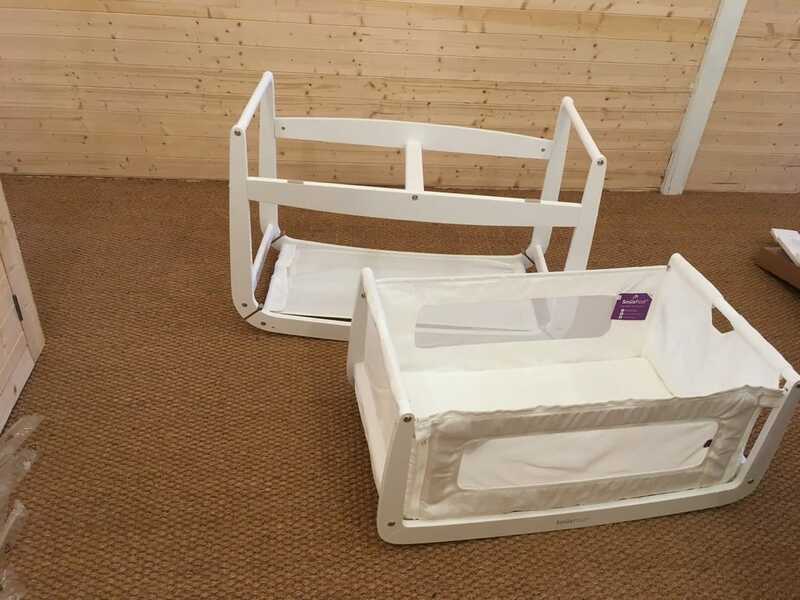 The SnuzPod 3 in 1 Bedside Crib is easy to assemble. Everything you need is in the box including the allen key required to put everything together. The instructions feature lots of diagrams to help you in the build process. The SnuzPod 3 easily attaches onto your bed with the included straps. 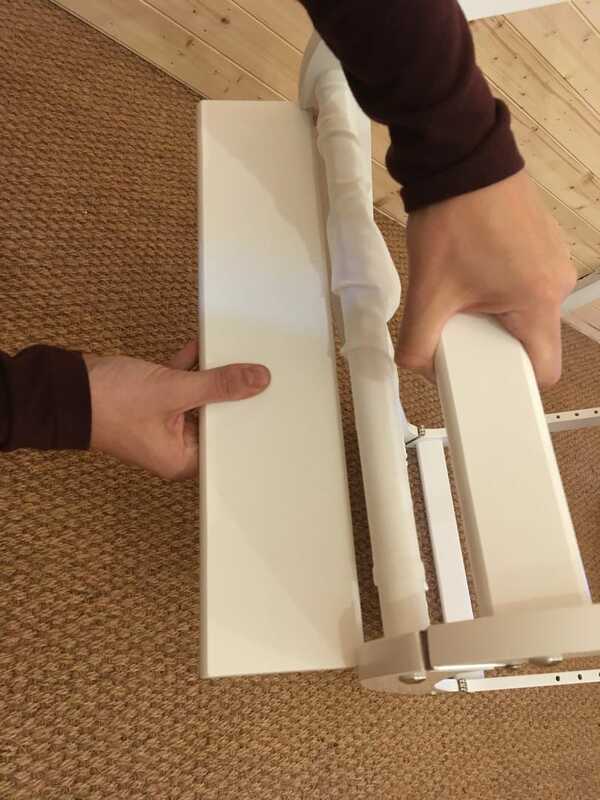 There is one set for divan beds and another for beds with a frame. 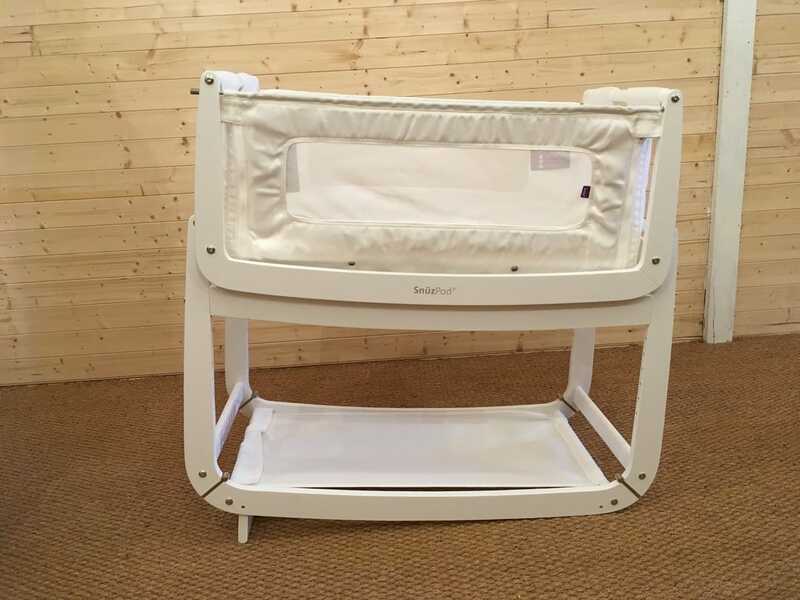 The crib can be adjusted to the 9 different height positions up to 61cm. When set up as a bedside crib, the SnuzPod 3 is ideal perfect for parents who choose to co-sleep safely. For added ease and convenience, one side panel zips down giving you easy access to your baby through the night. The SnuzPod 3 can also be used as a standalone crib. It has a slightly curved base so can be rocked to help sooth your baby. It also features a handy storage shelf underneath that is perfect for storing your baby essentials. One new feature that has been added to the SnuzPod 3 Bedside Crib is the reflux tilt. 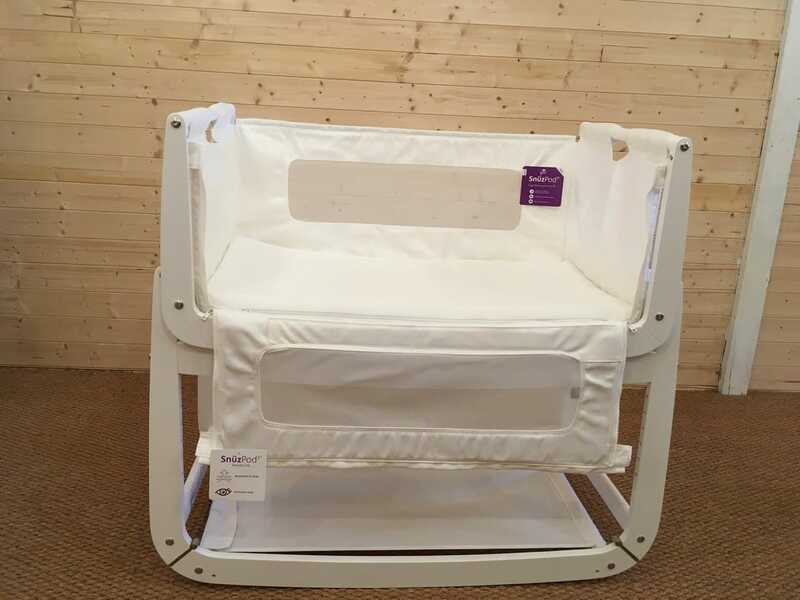 The crib can be tilted thanks to the separate reflux leg slots on one end of the crib allowing your baby to be more inclined which can help if they suffer from reflux. When using the SnuzPod 3 as a standalone crib, it is perfect for transitioning your baby into sleeping alone while still maintaining the familiar surroundings of the crib. The SnuzPod 3 has one final set up option – a bassinet. 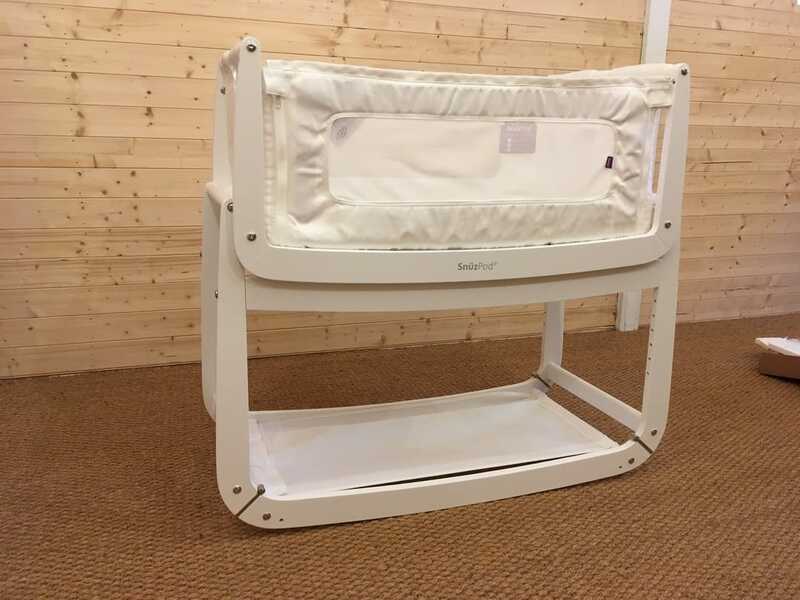 The bassinet can be quickly and easily be lifted off the crib frame which then provides a portable sleeping environment for your baby. It can be moved around the home, ensuring you are able to keep an eye on your baby wherever you are. The lift off bassinet on the SnuzPod 3 in 1 Bedside Crib is 20% bigger than the SnuzPod2 model but is 30% lighter than its predecessor. It now only weighs 4.1kg. The SnuzPod 3 in 1 Bedside Crib has some additional features that make it even more appealing to new parents. These include 2 mesh sides to allow sufficient airflow for your baby’s comfort but also to allow you to always be able to see what they are doing. A supportive mattress is included with your SnuzPod 3 in 1 Bedside Crib. The mattress is made only with materials certified as having no harmful chemicals or substances. SnuzPod 3 in 1 Bedside Crib has been designed and made in England using natural beech wood making it a very high quality crib. It is also the only bedside crib to receive the Queens Award for Enterprise! All fabrics can be removed and hand washed for hygiene and the entire SnuzPod 3 weighs only 11kg. It’s external measurements at maximum height are L100 x W49 x H95 . The SnuzPod 3 in 1 Bedside Crib is a highly practical, convenient and multi purpose bedside crib. 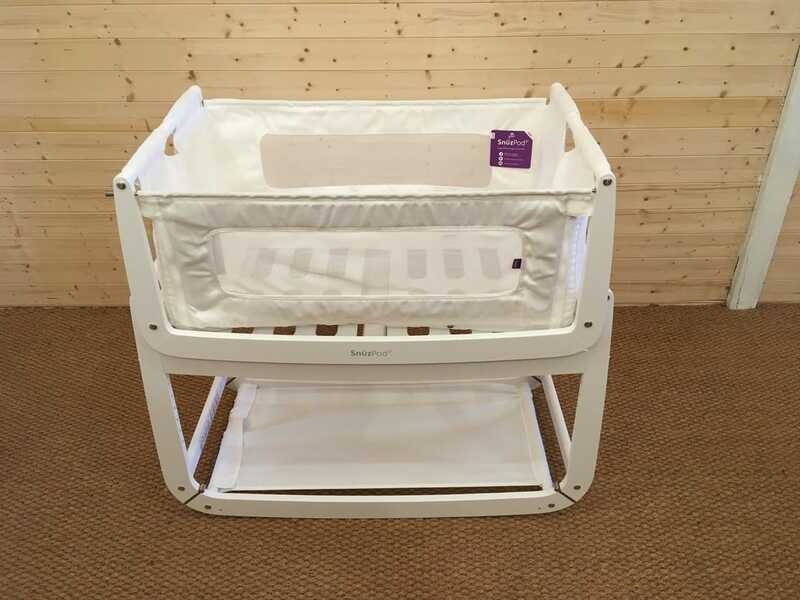 It’s ability to be used as a bedside crib, standalone crib or a portable bassinet make this a must have for any new parents. With the new additions of the reflux tilt and the larger yet lighter bassinet – the SnuzPod 3 in 1 Bedside Crib has managed to be even better than the already fantastic SnuzPod2 Bedside Crib.